Welcome to the first ever 3D Home Designs design challenge! I am sure as time goes on I will have a much better format for how I bring about these design challenges but since this is the first one it will show as fairly raw. I am going to be giving myself a bit more time on this challenge because unfortunately being from the Houston area, Hurricane Harvey has created devastation in my home town. My fiancé and I were fortunate to be able to leave Houston for Austin to wait out the storm, and from all reports we have received our home made it through with very minimal issues. As I work on this design challenge I will create updated posts with my progress. Because this is not a remodel, I fortunately do not have any constraints on the shape of my bathroom. 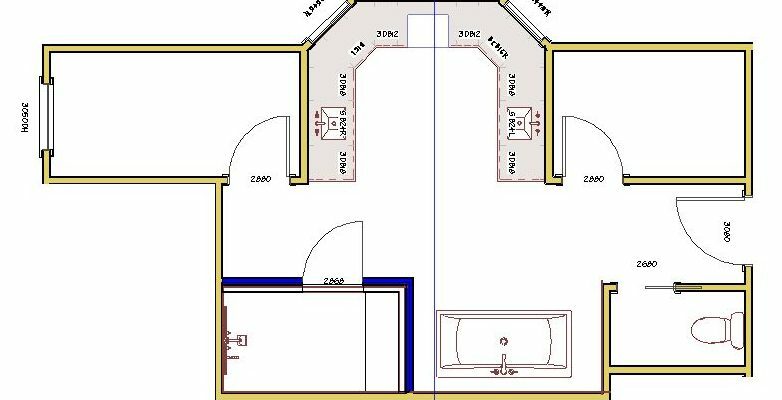 Since I do not have to fit into a set space my first step is to create a rough diagram for the shape of the room and where its entry points are going to be. When designing a bathroom it is very important to know where your focal point will be, where the entrance from your bedroom is, and how you will get into your closet. Once the shape of the room and the locations of all of the doors have been determined the first thing I like to configure is the focal point (typically can be a tub with a window over it, or a shower with an accent tile wall). Once you have your main focal point you need to work on the flow, where are your cabinets going to be and where you will end up placing all your fixtures. The best way to show the process is through visuals. As I move forward with the process I will update these posts with video’s and images explaining the reasoning behind my choices.